The IRIS Orchestra can thank Benny Goodman for one of its most notable performances this weekend. 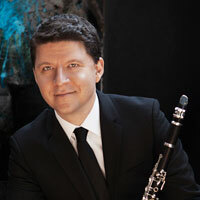 Clarinetist Alexander Fiterstein, guest soloist at the concert Saturday night at the Germantown Performing Arts Center, knocked it out of the park with his performance of Carl Nielsen’s Clarinet Concerto. When Fiterstein was growing up, he was fascinated by the Goodman albums in his parents’ record collection. The musical family also had plenty of classical works and the youngster was drawn to the sound of the licorice stick. The payoff was the soloist’s superb performance on a tricky instrument that can betray the best players, and of the 1928 composition that is a technical challenge and a work of sublime beauty. Fiterstein’s control of the clarinet was complete. Whether playing full, robust passages or the softest imaginable tones, he delivered a sensitive and precise interpretation. It was a truly exciting performance of a brilliant composition. And his encore of a couple of klezmer tunes was icing on the cake. Opening the concert was another terrific work, Bartók’s Divertimento for String Orchestra. Maestro Michael Stern elicited a powerful performance from the orchestra of this 1939 composition that mixes gypsy influences, Baroque references, wit, dread and luminosity. The two works are older than most of the audience, yet there was still some grumbling in the lobby that it amounted to too much modernity. Stern often programs to please common preferences (last season’s final concert was an all-Beethoven romp), so there ought to be generosity in welcoming less familiar works. It’s not like being forced to eat your peas — these decades-old compositions are vibrant and gratifying. That said, the evening concluded with Dvorák’s Serenade for Strings in E major, a pleasant, unremarkable work from 1875 beautifully performed by the orchestra and devoid of challenge.